If a person surrounds themselves, consistently, with questionable characters, is it fair to start associating that person with company he chooses to keep? Militant Panthers endorse Obama...What do the separtist Panthers know that we don't about Obama? "Barack Obama Is the Hope of the Entire World"
Al Sharpton and his National Action Network, whose record of inciting hatred of white people and especially Jews is well known. NYC racist Council Member Charles Barron - Black nationalist and former Black Panther. “He said he supports the black community. He’s said he’s been black all his life. You said he’s against black nationalism. He never said that. Matter of fact, he goes to a black liberation theologist church where they believe in a black Christ. So, he is for black people." "Black theology will accept only the love of God which participates in the destruction of the white enemy." Why in the world would Communists support Obama? Do Marxist recognize something in comrade Obama? Cuban Terrorist Che Guevarra hanging 'above the fireplace' in Houston. Obama TEACHING students Marxist-organizing through Alinsky's "Power Analysis" philosophy. The New Party is an unabashed Marxist “fusion” party from which Barack Obama actively sought out and received an endorsement for his state senate candidacy in 1996 and he used a number of New Party volunteers as campaign workers. 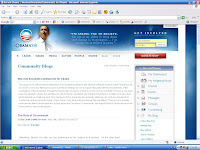 Sam Graham-Felsen, a journalist-on-leave from The Nation,[another communist organization] joined Obama for America in March 2007 where he works for the New Media department as the official blogger, daily presenting the campaign’s public face @ barackobama.com. Here is a flag, Obama staffer, Graham brought back from Russia to hang in his apartment. Most people in the country are suffering in some way or another. Housing, jobs, employment, health care, the wars, gasoline prices...you name it it is probably touching us all in various ways that are hurting. So when someone comes along and shouts "CHANGE!" we need a "CHANGE" - we are all liable to perk up and shout - "OH, Hell Yah! Fock this sh*t! I need a change, jack!" But most won't even see or hear anything beyond that word "change". If a devil came and told you he could 'change' all those above things for you, and all you had to do was believe in him and become one of his followers, would you except the trade? People are hearing the word "change" because they so despartley need it - but they are oblivious to the consquences of this snake-oil salesman, Obama. He bounces left right and center because he has no core, no truth in values, no conviction in words. Obama was one way, and said things one way, against Hillary. When things on the ground changed and he is facing McCain, with the very same issues, his position has to now change. A different kind of 'politician', eh? In order to invade the White House, the legislatative, and judicial branches, with Communist, radicals, racists, and terrorist sympathizers, (Obama appointments) who will be making and administrating their neoLaws and programs, Obama must appear to be all things to all people right now. Obama would change again quicker than gas prices once he was crowned. Hundreds of thousands have died to protect this country, and yes to help further wonderful 'changes' in this country. These brave souls would never turn this country over to a communist regime. We must not turn this country over to radical militants for a promised loaf of cheapened bread. We are Americans. We find ways to preservere! Look at Obama's friends, associates, mentors, teachers, pastors, and family. Look at the kinds of racist and Communist supporters Obama has and his radical campaign staffers and ask yourself can you trade your country's foundation in for what Obama himself means by change - and not what you thought you HOPEd it meant when you needed a "change". Do you have any idea at all how many people have been threatened with death for voicing oppostion to Obama or making a disparaging, or truthful, comment? The list is growing. Ask Steven Colbert. Ask Tavis Smiley, a popular African-American journalist and radio and television host. Ask Mr. anti-semite Al Sharpton who threatened riots in the streets. Vote against him and you get threatened chaos. Ask Mr. post-racial smirking Obama. This is the same kind of 'surrender', or else, blackmail that we get from Islam. It'll be something different, alright. The Marxist tenacles perhaps never removed from our government.